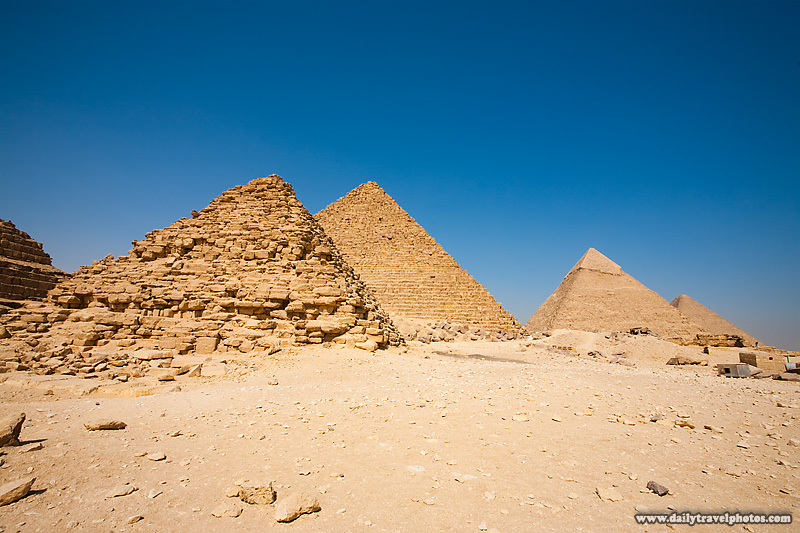 A unique view in order from smallest, the Queen's Pyramids, to the largest, the Pyramid of Cheops. It's all about perspective and a wide angle lens. While telephoto lenses compress, wide angle lenses have the opposite effect, making distant objects appear small. Please be patient. Often panoramas consist of many megabytes of stitched photos. An initial black and white image will be replaced by the full color image when panorama download is complete. Hold down the left mouse button on the flash object then move the mouse to navigate in any direction. A user-controlled panorama from the base of the Pyramid of Menkaure. Coming soon, a full set of five (count 'em, five) user controlled panoramas in which you can click to various other panorama points within the Necropolis at Giza. For those that may never make it in person to the Pyramids complex, this should help to relay the layout of the pyramids. FYI, the array of housed colored lights at the base of each pyramid (seen in this panorama) is used to tastefully illuminate the massive structures at night. The lighted pyramids make for an beautiful backdrop to the laser-light show performed every evening at dusk. What I could do without was a creepy face, painted in by laser, on the Sphinx who acts as narrator to the history of the pyramids.